Marketing is frustrating because virtually all common-sense ideas are wrong. 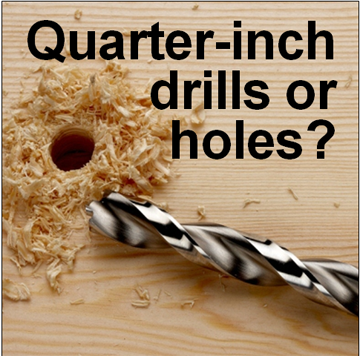 Take Theodore Levitt’s famous maxim, People don’t want to buy a quarter-inch drill. They want a quarter-inch hole! True perhaps, but that seduces marketing people into promoting better holes when they should be promoting better drills. Should you promote the benefit of your brand (the hole) or the feature (the drill)? Logic suggests you should promote the benefit, the hole. Because, as Ted Levitt said, People don’t want a quarter-inch drill. They want a quarter-inch hole. Taste is King is Burger King’s latest slogan. But how many consumers are going to think, Let’s go to Burger King because the burgers taste better? On the other hand, Burger King was extremely successful with its advertising campaign, Broiling, not frying. Consumers thought, Burger King hamburgers must taste better because they are broiled and McDonald’s hamburgers are fried. Why promote features when consumers want benefits? Because “benefits” alone have little or no credibility. Back in 1975, BMW introduced an advertising campaign that would make the brand world-famous: The ultimate driving machine. But here’s an interesting fact. When consumers are asked why they bought a BMW, they seldom say, Because it’s the ultimate driving machine. What they do say is, Because it’s a fun car to drive. The benefit, not the feature. Given the research to back them up, marketing people might think that “fun” is the right position for the brand. But it’s not. Many cars on the road are fun to drive, but there is only one “ultimate driving machine” position in the mind. It’s that singularity that makes the position powerful. Not the benefit. Lately, however, BMW seems to have had second thoughts about The ultimate driving machine. The slogan is still there, but in tiny type, while the headlines focus on joy. Some examples. Joy takes your breath away and gives you room to breathe. Joy was born for the left lane. Joy is not pulling over anytime soon. Joy is 34 years in the making. For nine straight years (from 2001 to 2009), BMW was the largest-selling luxury-vehicle brand in the American market. Now that the brand is focused on “joy,” BMW has fallen to second place (from 2010 to 2014) behind its arch-rival Mercedes-Benz. Geox could have said, The healthiest, most comfortable shoes you can wear. Instead, the brand focused on its feature, The shoe that breathes. Years ago, Dove became the No.1 bar soap in America not by focusing on how gentle the soap was on your skin, but the fact that it was one-fourth moisturizing lotion. Television commercials showed a hand pouring moisturizing lotion into a bar of Dove soap, one of the most-powerful visual hammers ever developed. One of the problems of focusing on a benefit is the difficulty of visualizing the benefit. How do you visualize low maintenance, greater reliability, less downtime, longer lasting, higher quality and many other benefits? Abstract words are very difficult to visualize. Take Thomas’ English muffins, a brand which dominates its category. The brand’s slogan has nothing to do with the benefits of the brand, only its features. The original nooks and crannies way to eat. Boston Chicken and Boston Market. Boston Chicken was the most-successful initial public offering of 1994. Then the brand added turkey, meat loaf and ham to its menu. But why change the name to Boston Market? Burger King didn’t change its name when it added chicken and fish to its menu. Shortly after the name change, Boston Market went bankrupt. Regardless of what the chain sold, Boston Chicken would have been a much better name than Boston Market. You can visualize chicken, but how do you visualized market? Furthermore, Boston Chicken focused on rotisserie chicken which is tastier and has less fat. Now, what would have been the better slogan? Tastier and less fat? Too many slogans focus on benefits like tastier and less fat which lack credibility. But when you advertise an idea like rotisserie chicken, the prospect thinks, Great, rotisserie chicken is tastier and has less fat. When you stroll through slogan alley, you find most slogans are benefits, not features. Some examples. Ally Bank: Your money needs an ally. Bank of America: Life’s better when we’re connected. Charles Schwab: Own your tomorrow. Chase Bank: So you can. Dairy Queen: Fan food. Not fast food. Dell: Better technology is better business. I think not. It’s just an advertising claim. Regardless of whether your advertising claim is a benefit or a feature or just a glittering generality, it won’t work unless it’s memorable. How many of the slogans mentioned in this column are memorable? Very few. The only ones you are likely to have remembered before reading this column is The ultimate driving machine, The shoe that breathes, and The original nooks and crannies way to eat. The three slogans are memorable because they impact both sides of your brain, the left side which handles aural sounds and the right side which handles visuals. When you read or hear a slogan like The ultimate driving machine, it stimulates a visual in your right brain of a person driving an automobile. And since your right brain is site of your emotions, a “visual” word or phrase is emotional in a way that ordinary words are not. Take innovation, one of the most-common words in a CEO’s lexicon. In a recent keynote speech, Mark Fields, CEO of Ford Motor, used the word innovation 20 times. Innovation is a highly-abstract concept and also a worn-out word. In a 90-day period, there were 255 books published with innovation in their titles. Twenty-eight percent of business schools use the words innovation or innovative or innovate in their mission statements. Is innovation important? Sure. Innovation, like many other abstract words, is both important and useless. Important in business and useless in marketing. Yet here are some company that have used innovation in their slogans. Asus: Inspiring innovation. Persistent perfection. Firestone: A tradition of innovation. PPG Industries: Bringing innovation to the surface. Siemens: Global network of innovation. Thermadore: Real innovations for real cooks. A number of studies have shown that one way to be perceived as a leader is by using a variety of linguistic abstractions. “Leadership talk” is what helps an employee move up the organization charts. But what works in the boardroom seldom works in the marketplace. To get into a consumer’s mind, you need to forget about leadership talk and bring your ideas down to earth. « What can a red nose do?